1. 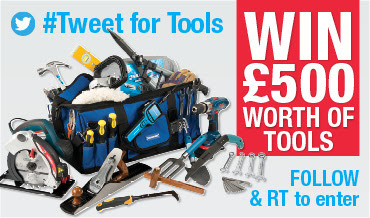 Entries must be made via Twitter by following @silverlinetools and retweeting relevant #TweetForTools graphic. 2. The competition will be run until @silverlinetools reach 15,000 followers on Twitter. 3. The winner will be chosen at random and notified within 7 days of the competition closing. 4. The prize is £500 (RRP) worth of Silverline tools. The winner will select tools of their choice to the value of £500. 5. Prizes are non-transferable and no cash alternative will be offered. 6. The promoter, Powerbox Limited reserves the right to publish the name of the winner. The winner is required to give their full co-operation to all requests by the promoter. 7. The promoter, Powerbox Limited is not responsible for inaccurate prize details supplied to any entrant by any third party connected to this competition. 8. The winners agree to the use of his/her name and image in any publicity material. Any personal data relating to the winner or any other entrants will be used solely in accordance with current (UK) Data Protection Legislation and will not be disclosed to any third party without the entrant's prior consent. 13. Employees and family and friends of Powerbox Limited or any third party involved are not permitted to enter the competition.